The Civic Fellows’ season has begun! Since our orientation on September 7, the fellows have taken part in many exciting activities and performances. We premiered a new, custom arrangement of Smetana’s The Moldau aboard the Island Party Boat for audiences along the Chicago Riverwalk as part of the city’s summer-long Second Tuesday concert series. The evening concluded with a performance at the Riverwalk Theater and a pyrotechnics display on the Chicago River for pedestrians to enjoy. The Riverwalk performance also marked the unveiling of a new chamber ensemble arrangement which we’ll perform throughout the season at various Chicago Public Schools and community locations and is comprised of selections from Beethoven’s Fifth and Sixth Symphonies, Rossini’s La Gazza Ladra and Smetana’s The Moldau. We were lucky to bond over this great music and share an incredible night of making music. The week prior, the fellows got to know one another with an outing at Guaranteed Rate Field where we watched the Chicago White Sox take on the San Francisco Giants. The game was celebrating “Half-way to St. Paddy’s Day” so all the attendees received Irish-themed newsboy caps, and reveled in some post-game fireworks! In mid-September we interviewed for our teaching placements with our wonderful partners at The People’s Music School. To guide us as we began the teaching year, Civic Alumni and violist Davis King returned to share his teaching wisdom at a fellows’ meeting. Davis, who is on the teaching faculty at the Merit School of Music, had great points and his presence was warmly welcomed and his guidance much appreciated — as is the case every time he visits! The fellows were on the go again in late September when we performed selections of the CSO Connect arrangement at the Illinois Youth Center Warrenville for the young men and women residing in the medium security prison. The residents sat within the ensemble and asked us questions about anything and everything as we led them through an introduction to orchestras. 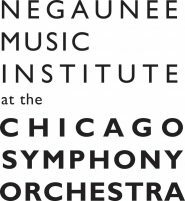 This visit also laid the groundwork for the following Sunday, when Maestro Riccardo Muti, musicians from the CSO, and singers from the Ryan Opera Center performed at the facility. Part of this preparation included a mini conducting workshop where our new friends at IYCW conducted several bars of Beethoven’s Fifth! The September 24th recital started with an awe-inspiring performance from Storycatchers Theatre to thank Riccardo Muti for visiting, followed by select Italian arias with Maestro, himself, at the piano accompanying soloists from the Lyric’s Ryan Opera Center. Following the opera portion was a pair of special performances by the CSO’s Principal Double Bass Alex Hanna and Bass Trombone Charlie Vernon, who had some very personal and kind words to share with the youth who performed that evening, but resonated with all in attendance. As we transitioned into October, the Civic Orchestra went on tour to DePauw University (Greencastle, Ind.). The orchestra was joined by the CSO’s Judson and Joyce Green Creative Consultant Yo-Yo Ma as part of the university’s 2017/18 Green Guest Artist series. The residency featured the orchestra at an open rehearsal, outdoor pop-up concert, formal concert, masterclasses, and community chamber concerts. The fellows demonstrated excellent leadership throughout the tour, including a post-concert panel discussion with conductor Edwin Outwater for the many DePauw University music students in attendance. I was astounded by the great questions from the students and even more blown away by the answers given by my friends and colleagues in the fellowship.